Warlords: Crystals of Power is a highly advanced video slot game, currently being prepared by the Net Entertainment studios. Planned to launch already on the 24th of November 2016, this epic casino experience is going to make quite the impression with its artistic take on the visuals that consist of magical realms and ancient battlegrounds. In the final conquest of the lands in Warlords: Crystals of Power, three powerful heroes have emerged to seize control over the entire kingdom and collect all of the eponymous crystals of power, the indisputable center of the conflict and the source of it. The Priestess, The Samurai and The Barbarian – each with their own agenda and a different set of skills, battle for control and treasures that are highly sought by everyone involved in this never-ending warfare. 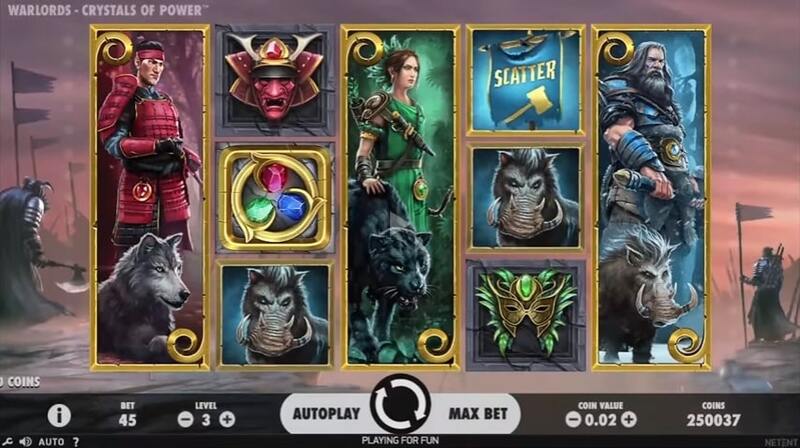 Players will be delighted to explore the fantastic world of Warlords: Crystals of Power, a legendary slot machine that comes with its own cinematic intro that serves as an introduction to the game itself. NetEnt has always been a leading software platform for video slots and other visually stunning video slots, such as the one that is going to arrive really soon to online casino worldwide. The technical setting also looks rather impressive: 30 fixed lines, 5 distinctive reels, 3 separate rows and a whole bunch of options. Random Features, Free Spins, Re-Spins, Scatter Symbols, Stacked Symbols, Wild Substitutions – all of this and more can be found within the setup of this original game. It looks like the end of this year brings another gem to the software collection, which is constantly expanding ever since the revolution of online gaming during the digital age of entertainment.